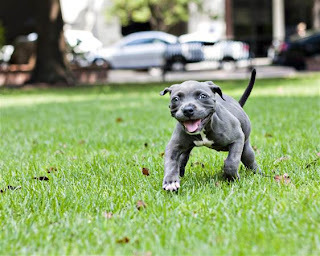 In today's heartwarming animal story, a pit bull puppy suffering from "swimmer puppy disorder" was on the brink of euthanasia but was saved by a kind volunteer and some alternative water therapy. 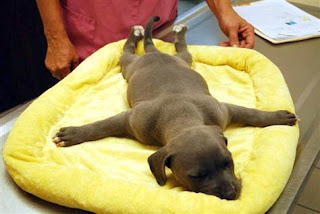 "Swimmer puppy disorder" causes stiff, splayed limbs. Harper's now a happy pup. But Daniels spent that night massaging the puppy's limbs and found that they loosened enough that the puppy was able to lift her head and even walk. A second opinion from a different vet confirmed that the puppy was actually healthy, and with extensive work at the Hip Dog Canine Hydrotherapy & Fitness in Winter Park, Fla., the dog, named Harper, is now walking and frisking with the other pups in her foster home. Daniel is having trouble with the thought of parting with her and is considering making Harper a permanent member of her household. You can read the whole story and watch video at the NBC link. Isn't it wonderful that scientists and veterinarians have created alternative therapies that can be used to rescue and rehabilitate animals in need? Thanks to Julia J. for the initial post! Top photo by Dolly's Foundation, bottom photo by Flyin Fur Pet Photography.